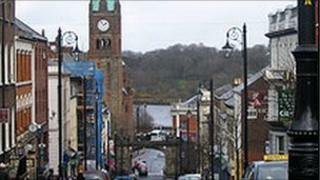 Business in Londonderry has been seriously damaged by the bad weather, a city centre traders' organisation has said. Shauna Duddy from Strand Road Traders Association said business "was at a standstill" on Saturday. City centre manager Jim Roddy said the weather had badly damaged business. "Saturday was very poor, but Sunday wasn't so bad, especially in the shopping centres. "Your heard bleeds for the independent retailers who are desperately trying to get people into their shops. "Once people get into the city centre they're generally staying in the warmth and comfort of the shopping centres, and that's causing major difficulties for the independent retailers."